The mission of Monroe County Hospital Foundation is to build relationships and broaden financial resources to sustain the healthcare programs, projects, and services of Monroe County Hospital. The Monroe County Hospital Foundation is a non-profit corporation and operating under a 501(c)(3) charter charitable organization. All donations to the Foundation qualify as tax exempt charitable contributions. Since its inception in 2000, the Foundation has raised approximately $400,000 in support of the hospital. 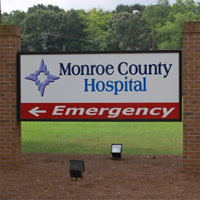 The Monroe County Hospital Foundation is an organization whose purpose is to raise funds to support the hospital in its effort to provide excellent healthcare to the people of Monroe and surrounding counties.